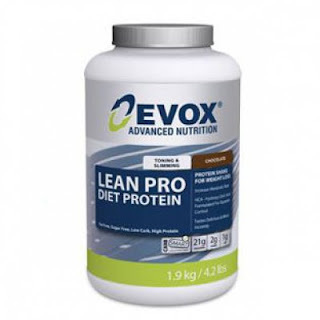 EVOX Leanpro Diet Protein mixes instantly, tastes great and is the preferred choice for dietary management of physically active or dieting individuals, thus providing a convenient way for precise caloric and macro-nutrient control. EVOX Leanpro Diet Protein is designed to help you lose weight for a leaner, harder and better looking body. This uniquely specialised high protein, low carb nutritional supplement, rich with essential micro-nutrient combination have been shown to reduce appetite and cravings, increase and stabilize energy levels and curb sugar and carbohydrate cravings and control appetite. EVOX Carb Smart Technology was developed by EVOX Advanced Nutrition to enable you to recognize low carb restricted nutritional products that are also very low in glycemic index values. EVOX Carb Smart branded products are designed to have limited impact on blood sugar levels and are suitable for carb conscious dieters. Mix 2 Heaped scoops (2 x 14g = 28g) with 200 - 300ml cold water or skim milk. Add or remove water or skim milk to acquire desirable taste and thickness. EVOX Leanpro can be used to supplement your mid-morning and mid-afternoon meals. EVOX Lean Pro Diet Protein is best used for active individuals on a slimming or diet program. Ultra Filtered Whey Protein Blend: (Whey Protein Concentrate 80%, Soy Protein Isolate 90%); Glutamine Peptides, Garcinia Cambogia (HCA); Essential Fatty Acid Powder (EFA); Raftilose Synergy 1 (Oligofructose Enriched Inulin Fibre). Other Ingredients: Soy Lecithin; Creamer; Permitted Flavourants and Colourants; Cocoa Powder (Only in Chocolate variant); Non-nutritive Sweetener (Sodium Cyclamate, Sodium Saccharin, Acesulfame K); Colloidal Silicone Dioxide (Glidant); Xanthan Gum; Sodium Chloride. Allergen Warning: Contains Milk, Soy and Wheat(Gluten).